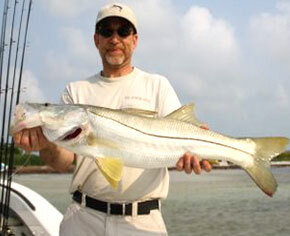 Absolute Florida Flats Fishing Charters with local saltwater fishing guides, Capt. 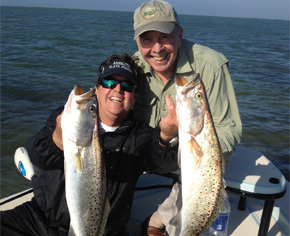 John Fischbach has been a fishing guide service on the West Central FL Gulf Coast for over 23 years, running over 4,000 fishing charters on the beautiful expansive Florida Gulf Coast from Tampa Bay to New Port Richey, including Clearwater and Tarpon Springs. 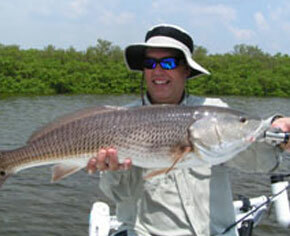 These ecosystem friendly saltwater flats stretch for miles and are full of rivers, channels, beaches, barrier islands, spoil islands, backcountry creeks, bayous, mangrove keys and shorelines dotted with oyster bars and shell points with numerous bird life that indicates there is plenty of predator gamefish bait right there. This is the inshore flats and backcountry fishing of the West Central FL Gulf Coast shallow water inshore fishing excitement. Whether you’re tarpon fishing, snook fishing redfishing, trout fishing and more or going for the inshore fishing slam (snook, redfish, trout in the same day) all on light tackle spinning, LIVE BAIT, artificial bait's of all kind. While skinny water flats fishing you will be aboard either a shallow draft tournament rigged state of the art charter boat the 18’8” Silverking Grande Master super silent poling skiff or a Marauder Marine Avenger 24. While on Reef/Wreck/Trolling charters from 10 miles to 150 miles offshore you will be aboard our Contender Boats 32' open with second upper station. Our private charter fishing trips of 1 to 6 persons per boat include all fishing license's and permit's, bait, tackle, and a cooler full of ice and spring water, all top of the line equipment, full electronics and cellular service, all USCG inspected, licensed and insured. We have great year round fishing on the West Central Florida Gulf Coast with an amazing number of saltwater sportfish species as mentioned above as well as Spanish Mackeral, kingfish, Florida flounder, cobia, grouper, snappers and more on our fishing guide service charters. To begin your ADVENTURE call 727-376-8809. GOOD YEAR ROUND FISHING !!! To Catch A Memory Call 727-376-8809 or 727-364-3265 Book Now ! Gratuities are Customary and are Appreciated ! !